In the previous post, I looked at the IMF report on Irish banks from the point of view of ongoing developments and balance sheet repairs (link here). Now, let's take a look at IMF report from the point of view of the ECB stress tests. Per IMF: "The ECB’s Comprehensive Assessment and corrective actions where needed are important to reinforce confidence in European banks, including in Ireland (see stress tests parameters described below). "AIB, BoI, and PTSB all reported capital ratios above the regulatory minima at end 2013. Notwithstanding, a finding of a capital need under the Assessment cannot be precluded, with results due to be announced in October." In effect, here's your warning, Ireland - IMF has no confidence as to the outcome of the tests and this is in line with the risks to the sector still working through banks balance sheets, as highlighted in the previous post. Never mind, though, as per IMF "Private capital is the first line of recourse and it is welcome that market conditions for European bank equity issuance currently appear relatively favorable." While IMF seems to think there are plenty of crazies out there willing to bet a house on banks stocks valuations, the IMF is still hedging its bets: "Nonetheless, where private capital is insufficient, public support may be needed, including from a common euro area backstop to protect market confidence and financial stability; the possibility of ESM direct recapitalization should not be excluded." 1) Will ESM come in ahead of irish taxpayers? Answer - unlikely. 2) If ESM were to come in, will it have seniority over previous taxpayers equity in the banks (in other words, will it destroy whatever recoverable value we have achieved so far)? Answer - likely. IMF is less gung-ho on the idea of immediate state supports in the worst case scenario: "If the supervisory risk element of the assessment identifies other issues, such as profitability or liquidity, staff considers these should be addressed over time in a manner that contains costs while firmly safeguarding financial stability. This is especially important for PTSB, where staff continues to see risks to its return to adequate profitability over a reasonable horizon in its current form, but approval of its European Commission restructuring plan is on hold pending completion of the Assessment." 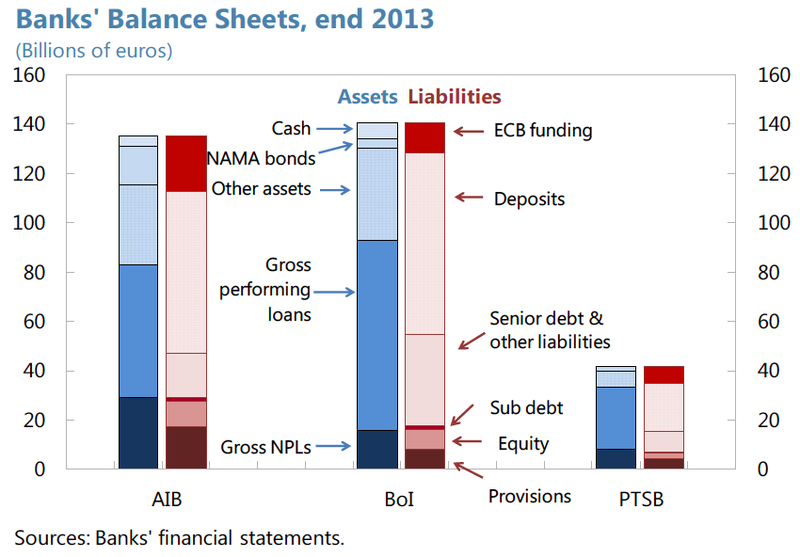 Watch that equity cushion in the above for PTSB and the margin on provisions… No wonder IMF is feeling a bit uneasy. But across all banks, Gross Non-performing Loans are nearly par or in excess of the Provisions + Equity + Sub-Debt. (iii) a supervisory assessment of key risks in banks’ balance sheets, including liquidity, leverage, and funding." First thing to note: the time horizon for tests is exceptionally narrow: 2014-2016, or 36 months, of which (by the time the tests are done, at least 6 months data will be already provided). Does anyone think Irish banks will have full visibility on risks and downsides expiring at 2016 end? Good luck to ye. "The AQR will audit banks’ banking and trading books. For each bank, at least half of the credit risk weighted assets and at least half of the material portfolios will be covered. For the banking book, the AQR will look at the impairment and loan classification, valuation of collateral, and fair valuation of assets, while core processes, pricing models, and revaluation of Level 3 derivatives will be covered in the trading book review. Compared with the CBI’s BSA in 2013, the AQR for the CA has narrower coverage of the banking book by risk weighted assets (RWA), it does not review banks’ RWA models, but does cover the trading book although such exposures are not large for the domestic retail banks." What this means is that the forthcoming tests are less robust than the CBI tests, but that assumes CBI tests were robust enough. IMF provides a handy set of charts summarising stress scenario, baseline scenario for the CA against IMF own projections. "The CA will apply a common equity tier 1 risk based capital floor of 8 percent for the AQR and the stress test baseline, and 5.5 percent for the adverse scenario, using the relevant transitional definitions. Results will be announced in October. If a capital need is identified, the additional capital will have to be raised within 6 months if the shortfall occurs under the AQR or baseline scenario, or within 9 months if it arises under the stress scenario." In my view, CET1 at 8% floor is a bit aggressive. The floor should have been around 9-10% for Irish banks (and all other distressed banks), while for stronger banks the floor could be 7-8%. But ECB does not want to differentiate ex ante the banking quality tiers present in the euro area markets. Which is fine, but yields and outcome that strongest banks have implied identical floor as the weakest ones. So overall, my view is that the IMF is being rightly cautious about the banks prospects under the ECB CA exercise. The Fund is hedging clearly in referencing the possibility for banks failing the tests. Key point is that the IMF - having had access to CBI and Department of Finance data and assessments, cannot rule out the possibility that Irish banks might need additional capital and that this capital may require taxpayers stepping in.